August 11 marked 50 years since Watts — along with most of South Los Angeles — erupted in six days of racially charged upheaval. Local and national media outlets marked the anniversary with coverage that revisits the police stop that triggered the upheaval, probes comparisons with Baltimore and Ferguson, and investigates the myriad and disturbing persistent problems. This is the important coverage we expected. "Our aim through this project was to facilitate better connections between reporters and leaders of community organizations, and to help them work together to identify stories on social change that could be amplified." But while reviewing history and examining persistent problems are critical, can anniversary coverage present an opportunity for media outlets to play another, potentially more lasting role? A cross-disciplinary team of University of Southern California Annenberg School Metamorphosis researchers, journalists and students joined forces in a nine-month collaboration investigating this question. The limited local news coverage of South Los Angeles, with a population estimated at nearly 1 million, tends to focus on crime or exceptional stories of individuals beating the odds. Previous Metamorphosis research has demonstrated that communities where residents have higher levels of civic engagement have stronger connections between local organizations and media. Although there are more active community and religious groups in South L.A. than in many other neighborhoods in the city, ties to media were found to be weaker than in other areas. Our aim through this project was to facilitate better connections between reporters and leaders of community organizations, and to help them work together to identify stories on social change that could be amplified. 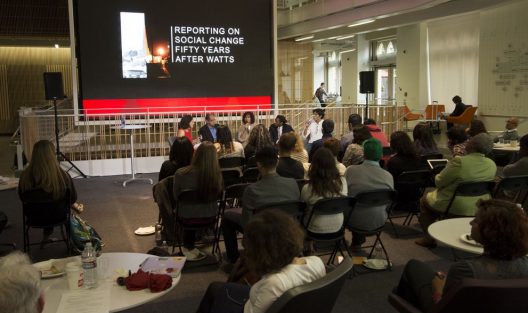 The result was a series of solutions-oriented stories — Watts Revisited — that ran in six news outlets, a public forum, and a model that we believe other communities could adapt to facilitate impactful anniversary coverage of social unrest. We started by looking at analyses of the problems and solutions suggested following the riots. The McCone Report, the result of a 1965 governor-appointed commission, documented how the riots started just southwest of Watts after a young black man was apprehended for drunk driving. But that was not the real cause of the riots. The McCone Report pointed to widespread inequality, citing among other issues a lack of affordable housing, health care, and job opportunities. These are, of course, some of the same structural inequalities that have come up today in the wake of Ferguson and Baltimore. (The report is also criticized for leaving out critical issues that resonate today, such as police injustice, prison reform, and unequal representation). Journalism students from USC’s Intersections South LA community news website teamed up with one from Augustus Hawkins High School, located in an area heavily impacted by the 1965 and 1992 riots. They went out in teams to ask residents of South L.A. what they saw as contemporary issues. Although the area has seen sweeping demographic shifts, they came up with many of the same challenges as 50 years ago: transportation, education, jobs, police reform, and housing were often cited. We then brought together leaders at six community organizations to collaborate on a “solutions-oriented” approach to covering South LA. We asked them before the workshop about persistent problems in their communities, but also about where they saw change happening that could be replicated or expanded. At the workshop we used the Solutions Journalism Toolkit to help them identify stories that are responses to social problems, and how they are different from a ‘good news’ story, puff piece, or public relations. Workshop coordinators also shared the perspective of reporters about the types of stories groups commonly pitch them — events, new programs — versus what they would like to be pitched — specific and compelling community trends, problems and progress. The organization representatives then tested their pitches on actual news outlets. Via a “speed pitching” exercise each of the reporters spoke to each of the organization representatives and learned about their story ideas, as well as issues in their respective communities. We found fostering trust is critical, particularly in areas like South LA, which are underreported and often portrayed negatively in the media. Organizations often lacked the resources, training, and connections to communicate effectively about their communities and need to understand how better connections with media will help them achieve their goals. Each of the six news outlets ran stories about existing problems in South Los Angeles, and potential solutions. The reporters had a deadline, and were provided an honorarium upon completing their projects. The topic of redevelopment and public space is a good example of how the collaboration developed. At the initial organization workshop Saundra Bryant, executive director of All Peoples Community Center, shared that buildings burnt to the ground in 1965 or 1992 were just now being rebuilt into grocery stores. Andres Ramirez, an organizer with Community Health Councils, independently shared that empty land was being reused to create public spaces for recreation. Both Bryant and Ramirez worked with USC trainers to create pitches about the topic. Reporters from LA Wave, KPCC, and Intersections South LA picked up the pitch about new efforts to repurpose empty lots and ran with stories that reached tens of thousands of people. The issue of jobs also illustrates the impact a bridging program like this can have. At the time of the initial workshop, Kirsten Grimm, the deputy director of the Coalition for Responsible Community Development (CRCD), had been working to get word out about a job-training program. With no dedicated communications officer, she expressed frustration with contacting the media. Meanwhile Brian Watt, a reporter on jobs from KPCC, had just received a report documenting that while unemployment dropped in the city overall, levels remained high in South Los Angeles. Initially his focus was going to be on why this part of the city continued to struggle. Meeting with Grimm introduced him to a solutions-oriented approach to reporting on joblessness — probing the problem but also a potential solution. In the end, three news outlets produced stories on the problem of unemployment and job training efforts in South LA — and how the CRCD’s WorkSource program at Los Angeles Trade Tech is trying to remedy that. Other stories ran on front pages of Hoy, La Opinion, LA Sentinel and LA Wave, the print outlets of the project. The stories did well on social media, including a story on empty lots converted into playgrounds that received 2885 shares 10 days after airing. On April 23, we hosted a forum at USC Annenberg with Erin Aubry Kaplan and her father Larry Aubry, both long-term South LA residents who have written on race and inequality. In attendance were reporters from all participating news outlets, as well as additional journalists from throughout the city. The forum included an interactive speed brainstorming session, through which additional community leaders and reporters got a chance to connect and generate story ideas. The final step for this project is a two-part evaluation Metamorphosis researchers will be conducting this fall. They will survey organizations and media outlets on the impact of their work. They will also be conducting a series of focus groups and A/B testing with community members to assess the impact of the solutions-oriented stories as part of a Tow Fellowship. Daniela Gerson (@dhgerson) is the Community Engagement Editor at the Los Angeles Times. She co-developed the Watts Revisited project in her previous role as Civic Engagement and Journalism Initiative director at University of Southern California’s Annenberg School as part of a team that included Metamorphosis researchers Minhee Son and Andrea Wenzel, project manager Evelyn Moreno, and Intersections South LA Director Willa Seidenberg. View more of her work here.